Gabe Cohn finds some laughs in Steve Martin’s shallow new play starring comedians Amy Schumer and Keegan-Michael Key. 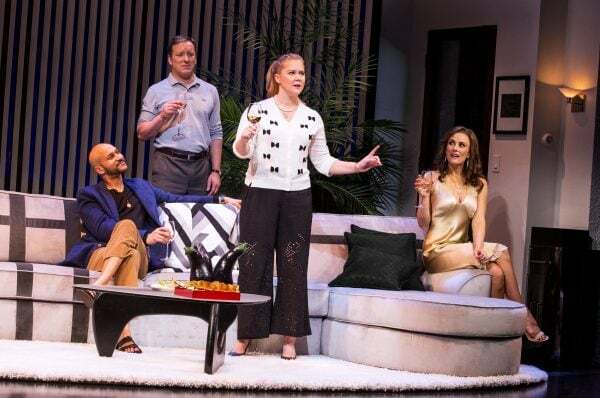 In Steve Martin’s serviceable new play, Amy Schumer and Keegan-Michael Key play two famous comedians making their Broadway debuts. Well, not actually. But the figurative masks that these actors wear for their actual characters are too thin for you to see them as anything else. As-written, they each play halves of separate couples (their partners are played by Jeremy Shamos and Laura Benanti respectively). Key’s character, Gerald, is the kind of guy who will show up to your dinner party with a bottle of red wine, tell you how expensive it was (eighty dollars), hand it to you, then ask for white wine with Pellegrino (if you have it), all while puffing out his chest like Popeye with a $700 jacket. Schumer’s Corky is the kind of hostess who’ll say yes, we have both, and politely try to reserve judgment on Gerald’s otherwise brutish first impression. But judging these characters by that initial impression is fair; no one gets much development beyond that. The reason Gerald and Laura (Benanti, shares a first name with her character) have come over for dinner chez Corky & Norm (Shamos) is to watch a meteor shower. The couples have never met before, so in addition to celestial occurrences there’s also the much more present and immediate fact of an evening set up to get to know two strangers. We come to know quickly that Corky and Norm have marital issues. They express this through a self-help ritual: every so often, when one says something mean to the other, they’ll both come upstage, link arms, and go through a well-worn script in which one says why they’re upset and the other offers responses along the lines of “I respect you” and “I value you.” (These beats are a place where Jerry Zaks’s direction shines. He does a nice job turning Martin’s quick and jocular gags into distinct moments.) The arm-link is clearly routine for the couple; it was probably picked up at marriage counseling, or from a book. While Corky and Norm are very much the type who would identify their issues, and read a book to work through them, Gerald and Laura are the opposite. We get the sense that the latter pair are more extroverts who blow entirely past self-reflection on their way to immediate and personal pleasure. As the evening plays out, Gerald and Laura make it clear that their intention is to seduce their hosts. That happens. And then, when things crescendo, the whole story gets rewound (I’ll leave out how) and we watch the entire evening play out again, only with the power dynamic between the couples reversed; suddenly, it’s Corky and Norm who do the seducing. Though the story flips, Martin denies us the richer option of allowing for these two parallel realities to be open to multiple interpretations. We’re only allowed one narrow reading by a line in Martin’s pointed ending. Like most lines in the show, it is meant as a quick piece of repartee, but what it does is force us into a single, flat conclusion of the play. That the potential for thought-provoking open ends would be tossed out for a mildly amusing crack is unsurprising, given that what the plot seems to really be there for is to carry us from one Martin witticism to another, with each funny moment milked accordingly. The performances embrace this. Key and Schumer both take visible joy in their roles, which may be bad for the audience’s immersion into this world of a well-decorated Ojai, California living room but good in the sense that laughing along with them becomes a highlight of the show. Giving into the comedians having fun is better than trying to get invested in these half-baked characters. Shamos and Benanti are both hilarious too, with Shamos playing Norm as a nervous nebbish and Benanti being the alluring seductress. Though of the four performers, it’s Benanti who manages to eke out the most depth from her role. She’s the only one who gives a sense that her character has internalized goals. Those who come to see Schumer and Key will likely be satisfied at the comedic ammunition each comedian is given, as long as they’re not expecting Martin’s material to be anywhere near as socially biting or conscious as his stars’ stand-up. Unlike either Schumer or Key’s own comedy, where laughter more often than not springs from the recognition of uncomfortable truths, Martin’s material does not ask us to confront ourselves in any deep way. The laughs he produces are the comfortable kind — you’re off the hook! He’d rather have you look up in wonder at the quick wit he puts onstage than look back at yourself. It feels a lot like stargazing. Cast includes Amy Schumer, Keegan-Michael Key, Laura Benanti and Jeremy Shamos.